Discussion in 'Magazines' started by rox_yr_sox, Mar 9, 2009. It's a long way from the surf of South Africa to the cover of Tatler. But this girl has history on her side. Despite growing up in relative obscurity in South Africa, the daughter of Diana’s brother, Earl Charles Spencer, Kitty Spencer strikes a sultry pose as she graces the cover of society bible Tatler magazine. The photoshoot follows in the footsteps of her mother, former model Victoria Lockwood, who was the magazine’s cover star almost 19 years ago. But the teenager admitted it’s really her father who she takes after. 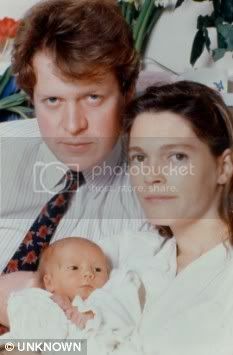 Kitty, seen at just a few days old with her parents, and her family quit England in 1995, around the time her mother and father were splitting up. One of her first public appearances came in 2007, at her late aunt’s memorial service, when photographs of her receiving kisses from Princes William and Harry were seen as a historic signal that the rift between the Spencers and Windsors had healed. But aside from that, she has kept away from the media spotlight and only visits Althorp, the Spencers’ ancestral family home in Northamptonshire, during holidays. Miss Spencer said she was shocked when she watched Keira Knightley’s film The Duchess, about Lady Georgiana Spencer, who grew up at Althorp and became the Duchess of Devonshire through marriage. Miss Lockwood, Earl Spencer’s first wife, had previously been named Tatler’s girl of the year in 1984 and appeared on their cover in 1990. And the teenager is adamant that the cover shoot is the only aspect of her mother’s past she is echoing. ‘I would never touch drugs – we saw what she used to be like,’ she told Tatler. ‘But she’s cool, she’s not over-protective. She doesn’t drill into us “Don’t touch drugs”. Living in Cape Town with her mother, who has now been clean for 14 years, her 16-year-old twin sisters Eliza and Amelia, and her 14-year-old brother Louis, has made Miss Spencer an unlikely ‘It Girl’. In 2007, Tatler named Miss Spencer one of the most eligible girls in Britain. But she is now off the market and dating a 21-year-old professional surfer called Jasper. ‘I’ve known him since I was 12, but then he left school and disappeared on his gap year,’ she said. The teenager, who is studying politics and psychology at the University of Cape Town, spends time at the beach, goes on safari and has even cage-dived with sharks. •The April issue of Tatler is on sale from Thursday. she's pretty! for me this cover is what tatler is all about. gorgeous society women who have zero relevance in the 'real' world. tatler should be escapeism and a window on that world. This just makes me gag, everything about this, the fact she is on the cover just for being related to someone iconic, the cheap trick with the tiara....why would anyone want to read about her life?Oh wait, its Tatler their readers probably would. i think its very distasteful tatler's obsession with royalty. thank god american magazines arent that slavish. her father seems like an upstanding kind of guy however. i wonder if her father encouraged posing for the mag. ^ but Americans and american mags do have an obsession with the idea of American Royalty, eg. the Kennedys especially (the astors, vanderbilts etc.). Although the Kennedys do/did contribute to public life, the coverage of them by mags like Vanity Fair is surely overkill, even if the the journalistic quality is of a higher calibre than Tatler. Just because americans don't have an official royalty, it doesn't mean that people don't devote column space to high and wealthy society, which is the u.s. equivalent of nobility and royalty. The tiara is in really poor taste. I've actually met Kitty once The cover is awful,what is she gawping at? I'm not going to hate on this because as the daughter of British rock legend Adam Ant and Lady Amanda Harlech I am fully expecting my first Tatler cover within the next few months. Look for me. I'll be wearing Gareth Pugh and the biggest gaudiest, ugliest rock you've ever seen in your life. Pure class. Other than the fact that I agree with others that it is tasteless and irrelevant, they didn't even make her look good. That super harsh, oversized eyeliner is so dated, and compared to the brightness of her skin makes her look like a WAG circa 2005. Think how nice it would have been to make her look fresh faced, care free and laughing/smiling and put on the tag line something to the effect of 'the next generation of royalty' instead of this cover which it looks like a 12 year old girl put together. Lucie Goulet tips her hat to high society toffs in a review of UK Tatler. This is a historic issue of the magazine. Not only does it celebrate 300 years of Tatler, but it is also the last issue with Georgie Greig as Editor. Tatler is a magazine of traditions. For its 300th anniversary, Ticky Hedley-Dent revisits 22 years of Tatler cover girls. 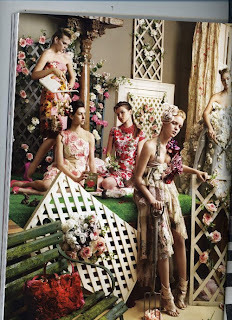 It’s a mixture of actresses (Keira Knightley, Emma Watson), society girls (Sheherazade Goldsmith, Jemina Goldsmith), It girls (Pixie Geldof) and fashion muses (Daphne Guinness, Sophie Dahl). This year’s cover girl is Kitty Spencer - the blonde, 18-year-old Princess of Wales. She was raised in Cape Town, where she still lives, and is a “completely unspoilt South African beach babe”. Unfazed by the illustrious family history, she hangs out with her royal cousins Will and Harry when in London. She playfully poses for Thomas Nutzl in pastel outfits for her first society photo shoot. 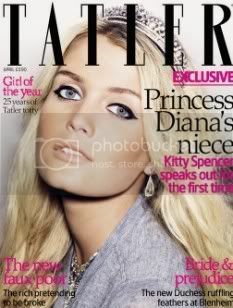 Before Kitty and Keira, Tatler’s cover was almost exclusively dedicated to well-born girl or famous actresses, as explained in “Front –Page Muse”. The Queen apparently has been on the cover more than anyone else, especially back when the magazine was a weekly. Other favourites have included Vivien Leigh and Marlene Dietrich. Former British SAS chief, Sebastian Morley, explains why he resigned from his mission in Afghanistan in his story “Who Cares Wins”. He expresses his anger at the Defence ministry and explains what needs to be done to improve the situation in his opinion. Not very glossy or glamorous? No. But then Tatler has a tradition of reporting on the armed forces and never shies away from a good article. And Morley is a son of the establishment, after all. In ‘Iambic what I am’, Geordie Greig meets with poet laureate Andrew Motion. Rather than writing odes to his monarch, the man spent the past ten years of his tenure exploring the boundaries of poetry, grief and love. “Closet Cases”: Closet features are jealousy-inducing articles. If you don’t like green, avoid the descriptions of Lisa Bilton, Amy Molyneaux and Anouska Beckwith’s fashion possessions. “Bride & Prejudices”: A rich, three times married, property owning Duke with a history-charged name (the 11th Duke of Malborough) and an improbable nickname (Sunny) marries a slightly younger, nearly as rich woman (Lily Mahtani). Fourth time lucky? Does it sound like a high-society scandal you’ve heard many times before? Well dear, that’s because you have! “Illusions de grandeur” celebrates the English rose as well as eccentric English loves like cups of tea and fragile indoor gardens. “Look who’s folded now” showcases origami inspired dresses on a crazy-haired, Cher-reminiscent model.